One exam per person, not for instructional or group study use. For companies of 10 or less. Contact for us for larger organizations. One exam per person, not for instructional or group study use. Presentation for companies of 10 or less. Contact us for larger organizations. HERS Rater Certification Practice Exam Questions: 2 x 50-question HERS-specific multiple choice practice exam with answer key at the end of the exam with questions as similar to the actual HERS exam as you will get. 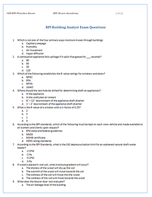 Free Bonus Item #1: HERS Rater Exam Formulas, take this formula cheat sheet with you during the actual exam to quickly calculate cylinder surface area, roof pitch, ventilation rates, C.O.P, weighted cumulative U-value plus all the basic areas and volumes you will need for the HERS Rater exam. Just plug you dimensions and your missing value is given. Easy to use and highly reliable in a time crunch. 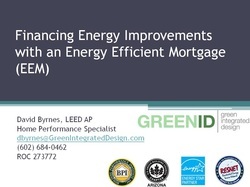 Customizable EEM Sales Presentation: Hit the ground running with a branded sales presentation on Energy Efficiency Mortgages, how they work, all their benefits and position yourself to be your local mortgage industries' EEM and HERS Rater go-to expert. This power point presentation is fully editable to paste your logo, contact info and add or remove slides as you see fit. I've used and refined these slides after years of doing presentations to loan officers, real estate agents and realty firms seeking to differentiate themselves. All the work has been done for you in these 40 slides and you will probably learn more about how EEMs work than you ever have before, the slides even include my notes and script for a smooth presentation. Free Bonus Item #1: 7 Steps For Real Estate Referrals: Have you thought to yourself if you could only develop relationships with a couple real estate agents how much more business you could have? The problem is that real estate agents are busy and sometimes hard to get a hold of with constantly shifting schedules. 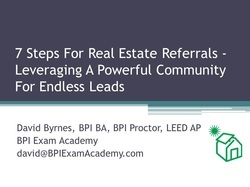 The 7 Steps For Real Estate Referrals is a proven plan for home performance professionals to work with the real estate community that anyone can follow to increase their business. This simple guide will take you step-by-step to show how to get in their offices, hold their attention and keep the referral calls coming in long after you are gone. Learn what most fail to do and leverage this powerful community and reap the benefits for years to come. Exam content and bonuses are delivered within 1 business day of purchase via automatic email. Allow 1 business day to reply to inquires. See terms and conditions for more information.